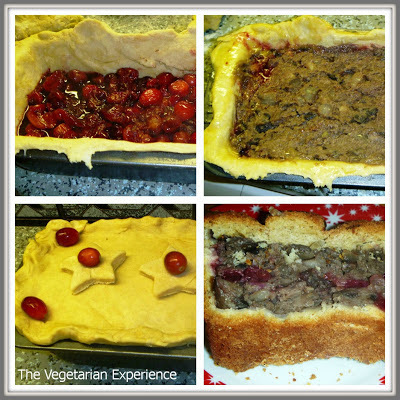 The Vegetarian Experience: Vegetarian Christmas Dinner 2012 - The Main Event! Vegetarian Christmas Dinner 2012 - The Main Event! 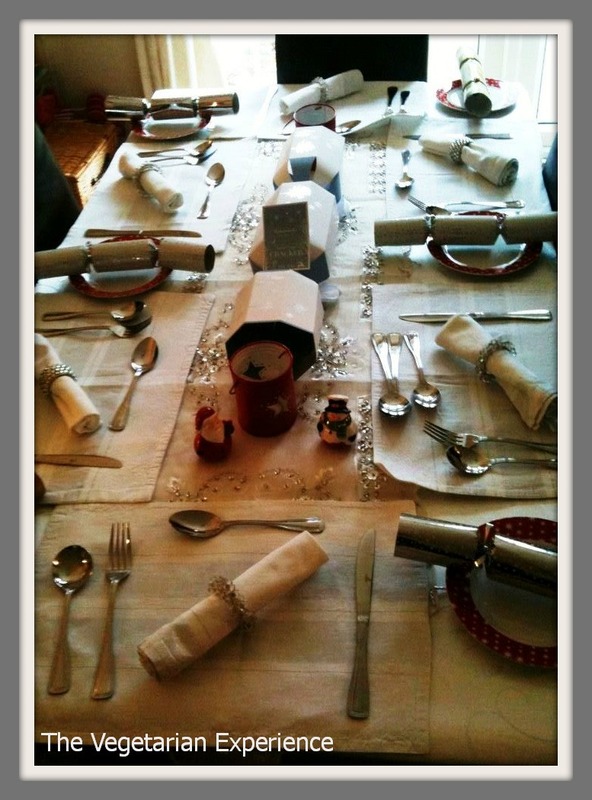 This year Hubby and I hosted Christmas Dinner at our house for six adults and two kids. This was a great chance for me to use the linen tableware which so rarely gets an airing in a house where plastic tablecloths are the norm. Although reds, golds and greens are traditionally what bedeck the table at Christmas time, I am quite a fan of white, silver and red, and so I chose this as the 'theme' for my Christmas dinner table. I think my family may not have forgiven me for not having Turkey on Christmas day, so my Mother-In-Law kindly cooked the turkey and the sausages, leaving me to focus on the veg, potatoes, stuffing, trimmings and of course, my Vegetarian main course. It took me a while to decide what to cook as a vegetarian main course, but in the end I decided on a Cranberry, Chestnut and Mushroom Pie. I enjoyed cooking the Gingerbread Stuffing and Cranberry Sauce. The Gingerbread Stuffing was really delicious and very easy to make. It contained apple, onion, and orange rind, along with two ginger cakes and egg and milk. The Parsnips roasted in Maple Syrup made a great change to traditional roasted parsnips which can be quite dry. 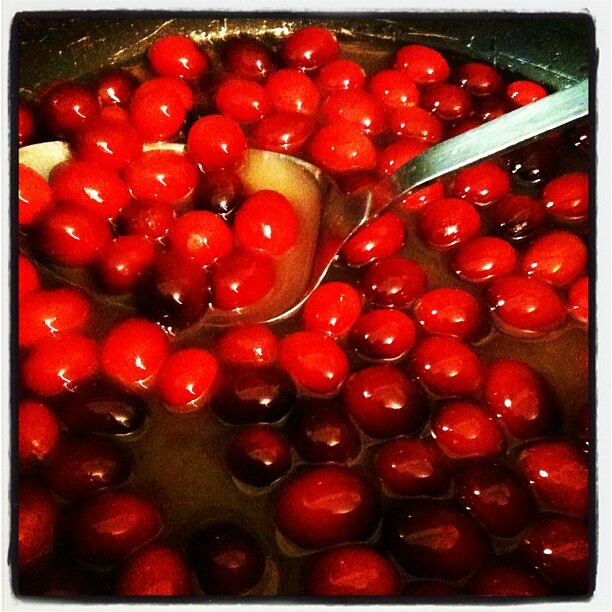 For the Cranberry Sauce I used fresh cranberries, sugar and orange juice, along with a little water. 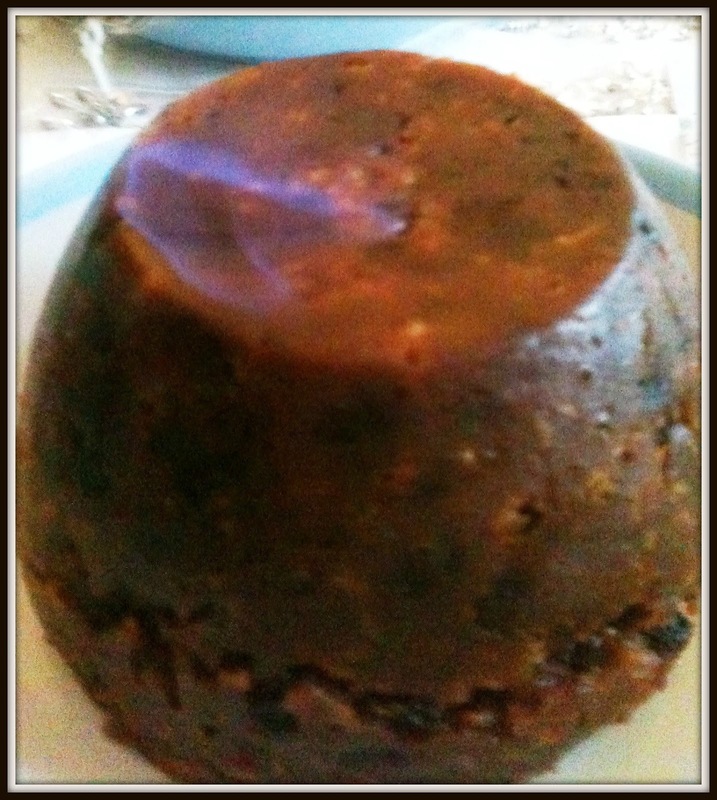 Christmas Pudding from a local Supplier - Nanna's Christmas Pudding, served with Brandy Sauce. This Christmas Pudding which I bought at a local food fayre tasted absolutely delicious and was so moist and full of flavour. I would recommend ordering from Nanna's Christmas Pudding's next Christmas! 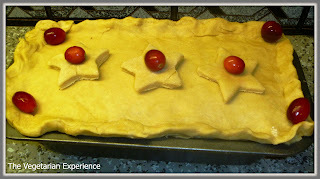 Here is the recipe for the Cranberry, Chestnut and Mushroom Pie. The mushrooms and chestnuts were mixed together, and the cranberries were cooked in port and sandwiched between the mushroom and chestnut filling, which gave a much richer flavour. 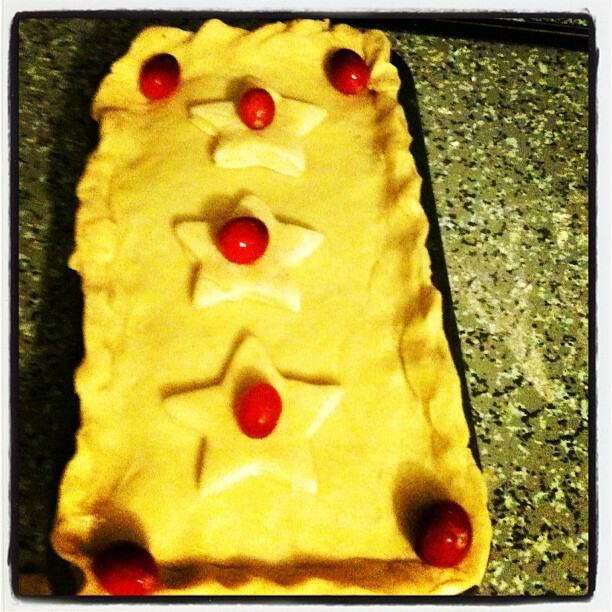 Cranberry, Chestnut and Mushroom Pie. 200g Whole Chestnuts - Vacuum packed, cooked and peeled. Make the fresh pastry, refrigerating for 20 minutes before use. Fry the onion and garlic in some oil for around 5 minutes until the onions start to soften. Add the mushrooms and fry for a further 3 minutes. Add the wine to the pan, stir well, and simmer until the wine has evaporated. Once cooked, remove the mixture from the heat, and add the chestnuts and breadcrumbs to the pan. Season with salt and pepper and set aside. In a separate pan, add the cranberries and simmer in a little port until the cranberries begin to pop. Drain and leave to cool. Brush a pastry dish with oil. On a lightly floured surface, roll out two thirds of the pastry and then line the base and the sides of the tin with pastry. Place half of the chestnut and mushroom mixture into the dish and smooth over the surface. Add a layer of cranberries over the top, and then add the rest of the mushroom and chestnut mixture over the top of the cranberries. Roll out the remaining third of the flour, until there is enough to create a lid for the pie. Place the lid over the top of the pie, remove any excess pastry, and press the sides of the pastry together to seal the lid to the base. If you like, you can create pastry shapes to top of the pie also. Brush the pie with beaten egg, and cook in the oven for around thirty minutes. Serve immediately. Sounds fabulous. As the only true vegetarian in the family (my eldest will eat fish cakes and won't eat vegetarian food! ), I had a Quorn cottage pie (ready made from the supermarket! ).